Have you ever heard the phrase, “If it isn’t broken, don’t fix it”? There’s nothing wrong with a classic bowl of ice cream, but to some, it could use some fixing. Some of the biggest ice cream lovers out there haven’t heard this expression and have created some of the most amazing, non-traditional ice cream creations that we have come to love throughout the years. We want to share with you some of our favorite, original ice cream creations that have completely changed the ice cream industry! For those times when we can’t sit and enjoy our favorite frozen treat, we can take them on the go in a sandwich form! The ice cream sandwich was one improvement to ice cream that certainly changed everything. 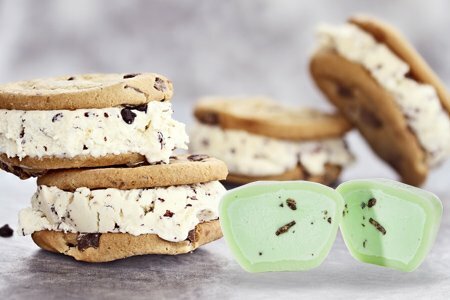 The first ice cream sandwich was dated back to 1899 that was created with classic vanilla ice cream squished between two thin graham crackers. Today, we see ice cream sandwiched between all kinds of treats. From chocolate chip cookies to shortbread to brownies—we’ve seen it all. Yes, you read that right. Ice cream tacos are a thing. Rather than using a waffle cone in the traditional sense, they are shaped like taco shells, filled with any ice cream flavor you can think of, then dunked in hardening chocolate. These magnificent treats are the perfect summer snack for the entire family and they’re easy to make! Gather friends and family to make your own version of ice cream tacos, complete with all the fixin’s for a fun afternoon. You can create snacks for the entire summer in just one day! Ice cream cake is exactly what you might think—a cake made completely of ice cream. Rather than a fluffy center, this type of cake is filled with your favorite flavor of ice cream, then coated in frosting, creating an extra sweet treat. This is the perfect celebratory treat for all kinds of occasions—from birthdays to graduations and everything in between. While there are many wholesale ice cream companies that sell these cakes pre-made, they are easy to make on your own! Layer your favorite cake around a center of thawed ice cream and freeze! Once your cake is completely frozen, spread your favorite icing or drizzle chocolate down the sides to complete your very own ice cream cake. This has been one of the most popular ice cream creations ever since their creation back in 1874. It is simply a class of root beer with a scoop of, traditionally, vanilla ice cream inside. Once you mix the two, you get a creamy texture that mimics a milkshake, without the effort. The rich flavor of the ice cream, combined with the sweetness of the root beer is the perfect combination to cool off. You can recreate this famous treat using your own favorite soda to cool down this summer, without breaking out the blender. It is simple and easy enough for the whole family to recreate! Our favorite ice cream creation is Mochi ice cream. This is a traditional treat from Japan that is a ball of ice cream, encased in a soft, rice flour dough, known as Mochi. These little balls of dough make for the perfect, bite-sized treat that can be enjoyed anywhere and at any time.